Will* 8 Sep 1814� He made a will on 8 Sep 1814, naming as executor(s) Nancy Ann Howard and James William Boykin, naming as heir(s) Clarissa Ann Owens. E-mail written 2006, 2011 to Warren Culpepper from Jennifer Mieirs, http://jenniferhsrn2.homestead.com, e-mail address (Dec 2011). The Culpeper-type microscope is an instrument made by the Englishman, Edmund Culpeper (c. 1670-1738). He also made other instruments such as theodolites, sectors, sundials and quadrants. His output of microscopes included not only the three-pillar instrument shown below but screw-barrel microscopes as well. The wooden pyramidal case for this instrument has Culpeper's trade card glued to the inside of the back panel. The exact date of its construction in not known, but it is likely in the period of 1730 to 1735. The sliding body tubes, made of cardboard covered by tooled green leather (inner tube) and shagreen (the rough dried skin of sharks or rays, on the outer tube), are connected by brass, turned tripod legs to a circular stage with a recessed central opening. The stage, in turn, rests on three similar legs which are fixed into the circular wooden base. The concave mirror attaches to the base as well, an original idea of Culpeper's, allowing transparent objects to be viewed by reflection of light from the mirror. References: Turner, The Great Age of the Microscope, p. 30ff. Biography* � Edmund Culpeper was an English instrument maker whose name is known to all those who are interested in the history of the microscope. Edmund is credited with popularizing two important elements in microscope design: the sub-stage mirror and the tripod microscope, which is referred to as Culpeper-type. 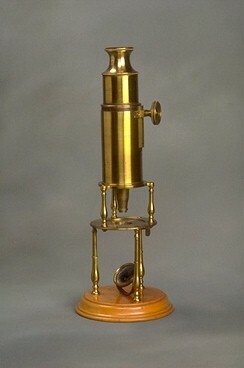 "The unsigned Culpeper-type microscope has two sets of brass tripod that support the stage and the body-tube. The swinging mirror is attached to the wooden base. The instrument also has the rack-and-pinion system on the outer tube, a feature that was later added to Culpeper-type microscopes. No accessories. About 1800. Unsigned." According to Ken Cozens of London, England who stated via e-mail on 5 March 2000 that this fact is published in Britain and Russia in the Age of Peter the Great, Historical Documents, from the School of Slavonic & East European Studies, London 1998, and the actual documentary evidence is listed in "Document 19", p16/17, "Account at the Armoury, dated 17 January 1700, of money disbursed to the British Merchant Andrew Stiles to repay his expenses for the support of Peter I in England". Which is taken from a Russian original. E-mail written Dec 2011 to Warren Culpepper from Steven E Ruzin PhD, Biological Imaging Facility, Univ. of CA, Berkeley, http://golubcollection.berkeley.edu/, e-mail address. E-mail written 5 Dec 2002 to Warren L. Culpepper from Stuart L. Warter Ph.D., (Member of the Microscopical Society of Southern California and Professor of Biology Emeritus, California State University, Long Beach), e-mail address. E-mail written Dec 2006 to Warren Culpepper from Elisabeth Bradshaw Nightingale (#56337), e-mail address. Robert C. Whitehead, "Malcom Robert Peacock Descendants"